An unmanned Russian Progress cargo ship loaded with 2.9 tons of supplies and equipment completed a smooth automated docking with the International Space Station Wednesday, three days after launch from the Baikonur Cosmodrome in Kazakhstan. It was the first Progress arrival since an August launch failure and the first successful linkup of a Russian cargo craft since June. The Progress M-13M spacecraft, the 45th launched to the space station since assembly began in 1998, docked at the station's Pirs module at 7:41 a.m. EDT (GMT-4) as the two spacecraft sailed 245 miles above northern China. The docking came on the 11th anniversary of the arrival of the first full-time crew on Nov. 2, 2000. "Capture. We have indicator mode," cosmonaut Sergei Volkov, monitoring the automated approach from the Zvezda command module, said through an interpreter as the cargo ship's docking system engaged its counterpart at the base of the Pirs module. Assisted by Japanese astronaut Satoshi Furukawa, Volkov was standing by to take over manual control of the Progress if necessary. But the spacecraft carried out a flawless automatic linkup and after residual motion damped out, the docking mechanism pulled the supply ship firmly into place. "Progress 45 is secured and we're looking forward to getting the hatches open and seeing what kind of goodies are loaded on there shortly," Expedition 29 commander Mike Fossum radioed mission control in Houston. "Sounds great. Nicely done up there," a flight controller replied. "Sergei and Satoshi did all the work today, they were standing at the ready," Fossum said. "I think it all went very well." Progress M-13M is loaded with 1,653 pounds of propellant, 110 pounds of oxygen, 926 pounds of water and 3,108 pounds of dry cargo. 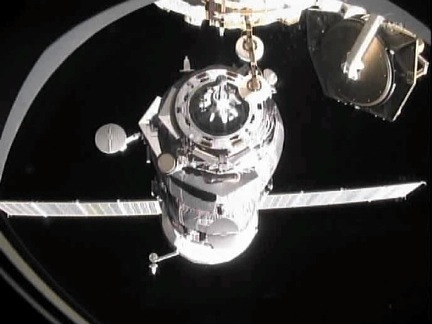 Today's docking was the first for a Progress since June 23. The M-12M Progress was destroyed Aug. 24 when the third stage engine of its Soyuz-U booster shut down prematurely due to contamination in a propellant line. Because the same third stage is used to launch manned Soyuz missions, crew rotation flights were put on hold pending a failure investigation. With the successful launching of the Progress M-13M spacecraft, Russian space engineers are gearing up to launch Soyuz TMA-22, carrying Anton Shkaplerov, Anatoly Ivanishin and NASA flight engineer Dan Burbank, on Nov. 14 (Nov. 13 U.S. time). The three crew members flew to the Baikonur Cosmodrome earlier this week to prepare for launch. "After the accident during the launch of a Progress cargo vehicle a couple of months ago, there's been some uncertainty in the program," Fossum said. "We've gone through a lot of work, the teams around the world, mostly in Russia, of course, have been involved with investigating the accident, trying to determine the root cause. We're very happy that a couple of days ago they had the first launch, successful launch, of the Soyuz rocket with the Progress cargo vehicle riding on top. The launch was flawless. "This was a huge step, this is a really huge step. This helps clear the rocket of any underlying problems and so the next Soyuz crew has already gone to Baikonur and are preparing to join us up here in just a couple of weeks."